My mind to me a kingdom is. – Epictetus. The man does not contain the mind: the mind contains the man. – Socrates. Everything possible to be believed is an image of truth. – William Blake. Try not become a man of sucess but a man of value.- Albert Einstein. From the stone age to the foundations of megalopolis and modern science, it was the use of numbers that allowed us to make that leap of civilization. Numbers help us at various levels. We use them to count objects, and a lot of other tasks such as to make statistics FN, to gamble, to tell what time it is now. Besides these utilities, numbers shaped the way we think the world. Einstein said that numbers are the “symbolic counterpart of the universe”, and according to Lord Kelvin “When you cannot measure…your knowledge is of a meager and unsatisfactory kind” FN. But the man that more importance gave to numbers was Pythagoras. He went to Egypt to learn the basics of a new science, a science unknown to the Magi of Persia, to the Chaldeans, to the Gymnosophists of India, to the Celts, to the Druids, to the so-called Barbarians. Pythagoras spent a long time in Egypt (Thales and Sidon, two of the Seven Wise Men of Greece, went before him) before to settle down in the south of Italy (in a region of Italy called at that time Grecia major) and to found a sect called the Italics . He went to Egypt departing from Samos, with Letters of Recommendation written by Polycrates to Amasis II, at the time King of Egypt, and a close friend of Polycrates. The court of Amasis was settled in Heliopolis, in the northern part of the Nile Valley . We must say that Egyptians at that time very rarely shared their sciences with foreign people, and even with their countrymen they only allowed them to go through their studies after a long period of probations. 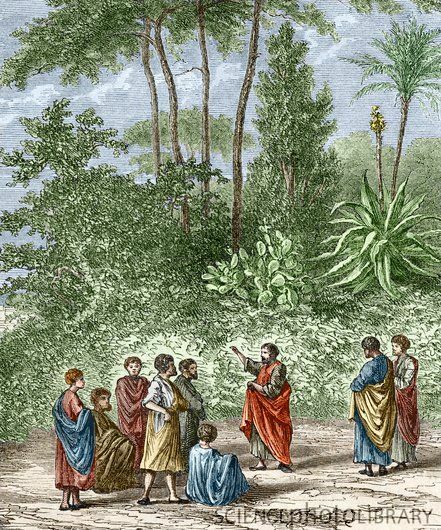 Hence, Pythagoras was sent to Memphis, and then to Diospolis, where the Egyptians hoped Pythagoras would be discouraged with the rigorous rules imposed upon the novitiate. But Pythagoras did not abandon its goal and was even circumcised. After his long absence, he [Pythagoras] found Samos in a condition very different from that in which he had left it. Polycrates, who had made himself absolute Master of it, as we hinted before, puff’d up with his prosperity, exerciced a tyrannic power over the oppressed Samias. Pythagoras hated injustice too much, and was too fond of right and equity, to undergo the yoke of a tyrant. He preferred a voluntary banishment to the slavery that threatned him, and went to find out a place of refuge, where he might preserve liberty, the most precious of all treasures, and for the preservation whereof all men, who have known its worth, have ever sacrificed all their, other goods, and even their life. That this life might well be compared with the Assembly that was held every fourth year at Olimpia, for the solemnity of the Games celebrated there; for, as in that Assembly there are some that come in search of glory, and the crowns that are rewards of the victors; others in search of gain, by buying or hiring out of merchandises; and a third sort more noble than the two former, come thither neither for profit nor applause, but only to enjoy the pleasure of beholding that wonderful spectacle, and to see and know what passes in it: so we in like manner, leaving our country, which is heaven, come into this world, as into a place of public meeting. There, some toil after glory, others for profit, and small is the number of them, who contemning and trampling under foot all manner of avarice and vanity, apply themselves to the study of nature: these left are they, added he, whom I call philosophers. And as in the solemnity of the games there is nothing more noble than to be a spectator whitout any interfere or selfish end, so likewise in this life, the contemplation and knowledge of nature are infinitely more valuable than all studies and applications. This extraordinary explanation of what is to be a philosopher can be resumed in this manner: Man was created to know and contemplate. Pythagoras was the man that loved numbers, that recognized in numbers representative value and spiritual values. He was a philosopher, mathematician, musician and religious leader. I am not sure if he was a mental calculator in the sense we give nowadays, but he was for sure one being that gave a decisive twist on human history. From his ideas sprang the modern mathematics and physical sciences, eagers of quantitative responses. Maybe for historical reasons, namely the attempt from the Hebrews to get independent from the Greek acculturation, Jews do not count their own people. There is a reference to this in Samuel II, Chapter 24, where King David was punished by God when he took a census of his people. According to the Jews, ascribing a number, a finite value to a Jew, which is supposed to have a spiritually infinite value, is wrongdoing. When the Jews needed to be counted at that time, each one contributed with a coin, and then coins were counted (see here). Also, long-term studies have shown that not every people developed the notion of the number the same way. At least, these are the recent findings of a French team of cognitive neuroscientists led by Pierre Pica, from the University of Paris. This team studied the Mundurukú, a tribe of Indians living in central Brazil. Mundurukú lacks a vocabulary for numbers beyond 5, and counting above numbers 4 or 5 needs the attribution of names to each number, otherwise counting becomes an impossible task. If you ask a Mundurukú with six children, “how many kids do you have?”, he will say, “I don’t know.” That’s what Pierre Pica recounts after his almost half a year living period among them. Amazingly, when returned to Paris, Pica realized, “When I come back from Amazonia, I lose the sense of time and sense of number, and perhaps the sense of space” [6,7]. Pica noted that the number of syllables of each word was equal to the number itself, but after number four this rule was not followed as if they could not count up to five but only to four. Pica said, “This is amazing since it seems to corroborate the idea that humans possess a number system that can only track up to four exact objects at a time” . Another fascinating discovery of this team, the Mundurukú do not distribute numbers on a linear scale. On Fig. 2 it is shown how Mundurukú distributes numbers. The intervals between the numbers start large and progressively decrease as the numbers increase in a kind of logarithmic scale. However, when American adults were given this test, they placed the numbers at equal intervals along the line, considering numbers are equally distant from each other. 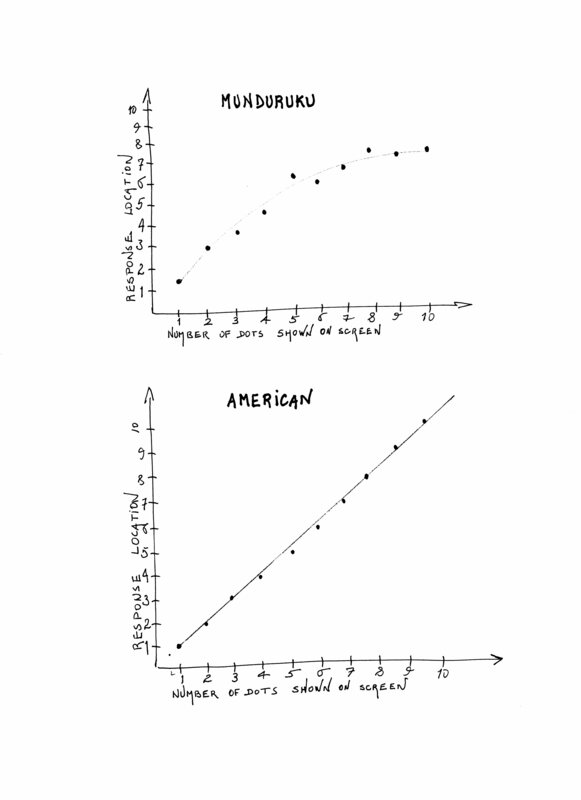 It is interesting to note that the logarithmic approach is not exclusive to Amazonian Indians, in fact, we all are born with that sense of numbers. In the kindergarten, children have the same notion of numbers logarithmically distributed. When they start studying at school, this natural intuition is lost, their minds are already culturally framed to “see” numbers linearly. Then we can go further in our thinking, and to argue that the madness of our current so-called “civilizations” is also based on this distortion of our minds, printed by the “school”, just invented for the purpose of formatting our minds. Therefore, we are framed to obey, to accept the “political” directives of our governments, enacted by lazy and corrupted people paid by outlaw corporations, without being able to imagine that other solutions (and probably much better) are still possible. No wonder that our planet is suffering from our immaturity and lack of ability to understand natural phenomena with mostly an exponential character (in fact, mathematically the inverse of the logarithmic scale behavior). But, what to think about our common use of numbers. Normal people do count numbers from 1 up to 10 without troubles, but common mathematical operations are usually done with the help of a calculator. The truth is that our brain has limited capacities. When adding decimal numbers, our brain can process 12 bits (binary digit) per second; when counting individual objects we can process 3 bits per second(! ), but our visual processing module can easily process 10,000,000 bits per second. In fact, only a limited number of the population possess the extraordinary calculation skills, an outstanding capacity in doing mental calculations. 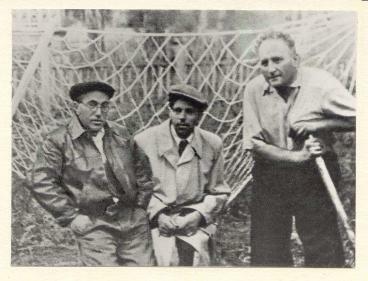 Win Klein was one of those while working at CERN. Among this class of people, we may also include Daniel McCartney, Salo Finkelstein, Alexander Aitken and Daniel Tammet. The existence of this kind of individuals naturally induces us to think about how they achieved their high level of attainment, how they succeeded in mastering their minds. Contrary to the general view present in our societies, the understanding the need of a healthy body in a healthy mind is not as simple as it seems. Besides the interest that each of us has in developing a healthy and vigorous (muscular) body, we also have interest in developing our “physical education” . This means to have delicacy of hearing (if you live in the jungle you need to recognize the slightest rustling in order to survive), the quality of sight (some blind persons know colors by touch, see movie below), the skill of hands and general motor skills of our bodies (athletes do need them,…and we, altogether), the sensitiveness of odor and taste (so important to wine enologists). 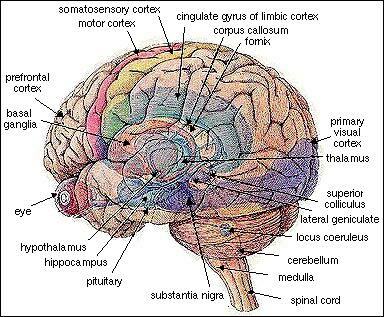 But if the impressions made by the exterior on the sense-organs, the nerves and brains seem to assure the certainty of the information we got from the world, the ensuing mental calculations and the body behavior may be somehow confusing. When we say that our senses deceive us, in fact, what we miss is the “art of interpretation”. “Trained perceptions are the very foundation of all mental power. – W. R. C. Latson, in Secrets of mental supremacy. The problematic of the mind-body is well illustrated with the Helen Keller’s extraordinary case. She was blind, deaf and mute. Keller did not have the innate ability and the genetic basis for interpreting the symbols that we have today, we people with normal faculties. The role of her teacher was crucial because she discovered that Helen could learn the meaning of “water” making water flow through her hands while writing on them the word “water”. This technique applied to Helen opened the whole world of the language and understanding and the story should be read by everyone [2,3] since it is an extraordinary example of the power of will in transforming our physical and intellectual capacities. The slow evolution that has shaped the brain and the primitive number processor that we all possess inside our brain, allows us to use current multiplication algorithm, the concepts of square root, complex numbers and the geometrization of physics. 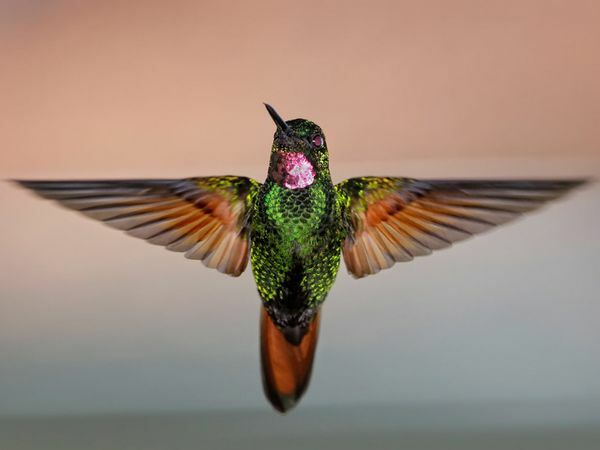 The evolutionary processes that shaped the brain are also at the basis of the generation of the delicate mechanism of vision, the hummingbird’s wings or the intricate mechanism of the ant’s body. Probably Platon and Aristotle although brilliant minds as they were, missed a mode deep understanding of nature if they had an observatory. But «in the last years of Pericles, the Athenian people passed a decree by which all who propagated astronomical theories were made liable to impeachment» (see p. 9, ref [4,5]). We must bear in mind that to the acquisition of knowledge is done only through our bodies, by experiencing our bodies. 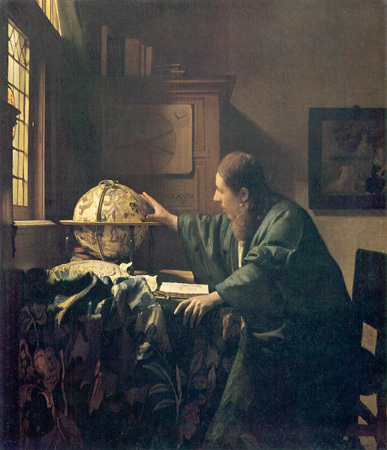 The Astronomer is a painting of the Dutch painter Johannes Vermeer in 1668, and it is frequently shown in books as an illustration of the movement of thought itself, giving an illusion of the concentration on a challenging task. The man which is portrayed is apparently Antonie van Leeuwenhoek, a man who was a tradesman and a scientist (should scientists return to this new form of living?…), the founder of microbiology. Several techniques may speed up mental calculations. As you may notice, these techniques are merely cultural inventions with the purpose to help us to handle numbers (remember, we all are excellent to count from 1 to 4…). And very good books were written to improve our abilities [1,2]. For example, suppose you want to multiply two numbers by the second digit below five by 11, such as 32×11. We sum mentally 3+2, which gives 5 and insert 5 between 3 and 2. In the following video, you can learn to multiply with your fingers. It is amazing too. In a world in turmoil, with unsecured foundations at a civilizational level, it is certain that this extraordinary capacity of mankind, the creative and constructive thinking, must be enhanced in our society. One requisite is certainly, to start talking more about the qualities of mankind, and not only dwelling about our defaults, our inabilities, which is too much frequently vehiculated by media, tearing down the dignity of the human beings, and putting serious threats to his freedom. So, finally Epictetus was right: my mind to me a kingdom is (read, in addition, Ref. ). FN Lord Kelvin created the absolute scale of temperature, enhancing the study of Thermodynamics and Statistical Physics. The great book of Nature lies ever open before our eyes and the true philosophy is written in it…But we cannot read it unless we have first learned the language and the characters in which it is written…It is written in mathematical language and the characters are triangles, circles and other geometric figures.-Galileo Galilei, Florence 1623. They that know the entire course of the development of science, will, as a matter of course, judge more freely and more correctly of the significance of any present scientific movement than they, who, limited in their views to the age in which their own lives have been spent, contemplate merely the momentary trend that the course of intellectual events takes at the present moment. Ignition is the process by which it occurs the propagation of a self-sustained combustion. An explosion (meaning a “sudden outburst”) is an exothermal process (i.e., liberate energy) that gives rise to a sudden increase of pressure when occuring at constant volume. It is accompanied by noise and a sudden release of a blast wave. 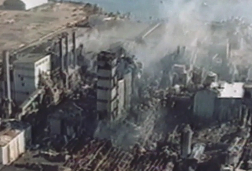 An explosion may occurs in gases, dust or with solid explosives. In quite general terms, any kind of solid material that burn in air (or in oxygen rich environment) will burn more fastly with decreasing graininess. By order of importance we may say that firewood burn slowly, burns better when cut in smaller pieces, and burns fastly when cut in small particles. We are concerned here with dust explosions, due to its importance not only industrially, but also in households and schools. The formation and ignition of dust clouds in industrial and agricultural environment is associated to extremely violent and damaging explosions, particularly in coal dust explosions in mines and dust explosions in grain elevators. The dimensionless number that characterizes the possibility of a system to ignite is called the Darmkhöler number, D_a, which represents the ratio of the rate of heat production within the system due to exothermic chemical reactions to the rate of heat loss due conduction, convection or radiation. if we assume the dust made of single cubes of edge length x . 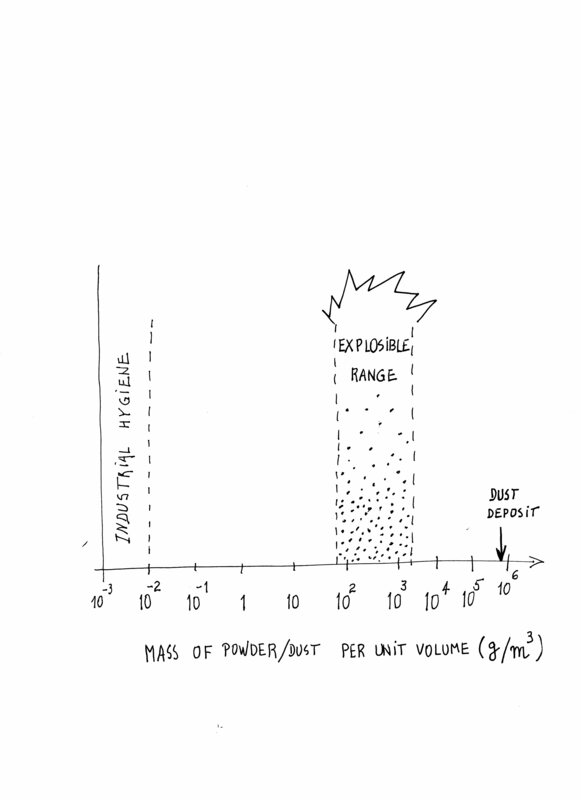 The maximum rate of preassure increase in closed-bomb experiments gives a measure of the expected violence form an explosion of a dust cloud. There is a linear dependency between the time rate of preassure increase and the specific surface area, as shown in the Fig. below (extracted from Ref.). Not all materials can cause dust explosions. For example, silicates, sulphates, nitrates, carbonates and phosphates, and in general terms stable oxides. But the contrary, materials highly explosives are the following: natural organic materials (e.g., grain, linen, sugar); synthetic organic materials (e.g., plastics, organic pigments, pesticides); coal and peat; metals (e.g., aluminum, magnesium, zinc, iron). An example of a highly explosive bomb is the thermobaric weapon that works consuming the surrounding oxygen instead of the oxidizer-fuel mixture, and for that reason it is more destructive than usual bombs. One important parameter that determines the amount of heat liberated in a explosion is called the heat of combustion (see Table 1). From the above Table 1, we may infer that Calcium (Ca) liberates more heat and coal contributes just one third of the former. Experiments have determined the range of explosible dust concentrations in air at PTN conditions (that is, at normal temperature and atmospheric pressure) for natural organic dust, see Fig. below. The dust particles may fluctuate in a given container due to repulsive electrostatic forces exerted between them. Although the above method is quite empiric, we may seek for a general mathematical theory to describe ignition and combustion. The most interesting framework is the one proposed by the Soviet school of physico chemical processes. where A is called the prefactor, R is the Universal gas constant (R=8.3144621(75) J/mol K), and Ea is the activation energy. 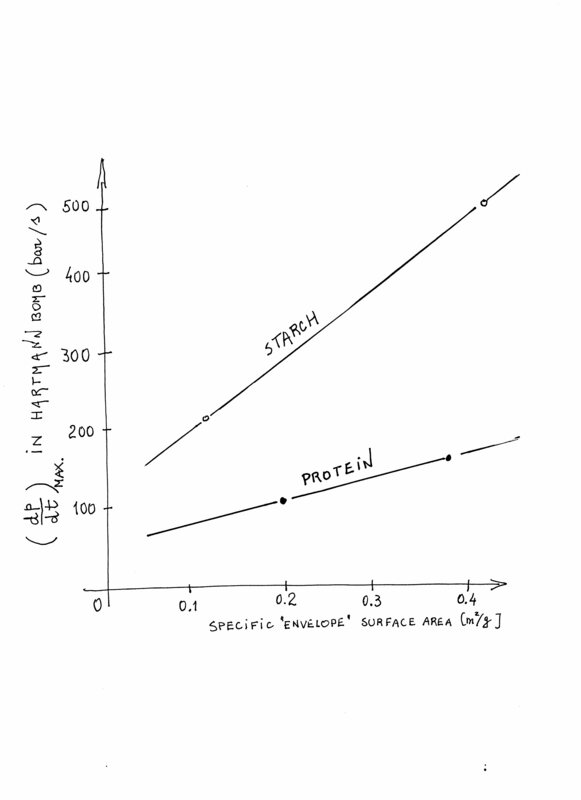 The ratio Ea/RT is called the activation energy. Due to the exponential dependency, an increase of the temperature by a factor of 2 can increase the reaction rate by a factor of 10-12 orders of magnitude. This is a striking example of exponential phenomena in the natural world and from this mathematical function results the general concern about global warming. Now, let us see understand what phenomena we intend to describe quantitatively. Let us begin by observe the propagation of a flame front. Here, w_i is the specific mass of the i-species, w_i=m_i/m, with m the total mass of our system (e.g., fuel + oxydizer), D_i^M is the diffusion coeffient of species i into the mixture of other species (they can be read in Tables or calculated through analytical formulas). In this Eq. is the mass density ( ) of the mixture (e.g., fuel+oxydizer), v is the mean mass velocity of the center of mass of the mixture, is the specific heat capacity of the specie i, λ is the heat conductivity of the mixture. The above equation is based on the “Analytical theory of Heat”, proposed by the French scientist Joseph Fourier  (see also footnote 1). The time derivative dY/dt represents the temporal changes of the variable Y at a given position z, the term in A represents the molecular transport associated to diffusion and heat conduction, the term with B represents the flow and the last term C contains the effects associated to chemical reactions occurring locally (at a given z). 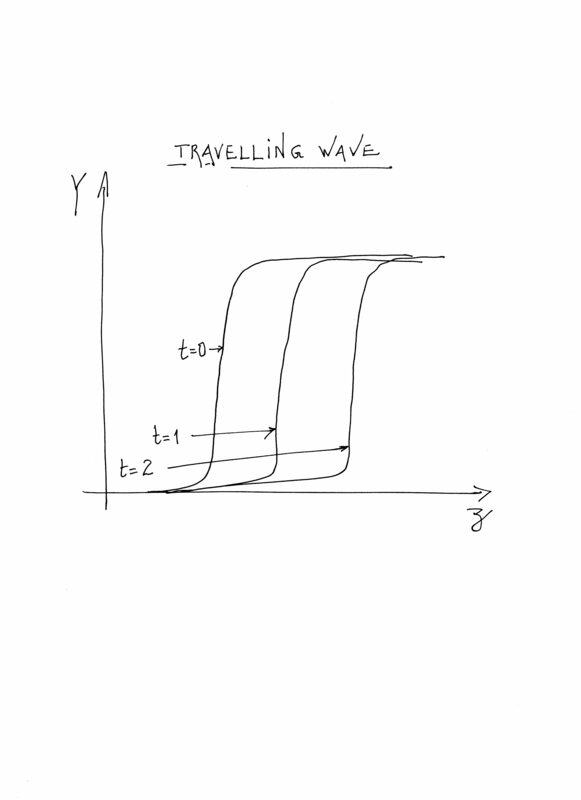 The shape of a travelling wave does not alter with time and we represent graphically in the fig. this process. Bill Gates is committed to support investigation in a new kind of travelling wave nuclear reactor, read here how it works and see the movie below. Here, T_w is the wall temperature of the container where is supposed to be the explosive mixture. And again, it can be shown mathematically that the above equations has stationary solutions for any δ < δ_crit, with δ_crit=3.32 in spherical geometry. This means that for a given system (fuel+oxidizer) and a given wall temperature and container with size r_0, explosion will not occur provided we maintain δ < δ_crit. This short compilation may help the reader to get a glimpse of the complexity of the processes of combustion, ignition and means to control these phenomena. More deep information can be obtained in our proposed references. (1)-Joseph Fourier was also a precursor on Global Warming Studies, see this site here.